Experienced Marketing Manager, E-Commerce Nut, Content Strategist, Event Planner, Social Media Manager, Music Critic, & Blogger. This is far from likely to be the last post with the phrase “Courtesy Penzeys Spices” attached to it. Just under a year ago, my parents introduced me to the culinary company, based out of my birth-state Wisconsin, with a jar of Penzeys Frozen Pizza Seasoning and Penzeys Arizona Dreamin’. These two spices kicked off a slow but rapidly escalating obsession. Fueling the fire was, again courtesy my parents, was a Christmas gift: a subscription to the company’s catalog and an introductory set of spices including Cajun and Chinese Five Spice. The first catalog arrived and seeing the deliciousness that was the Kai Pa Lo recipe (courtesy to Penzeys’ one Jennifer Sombutamai), I had to try it. 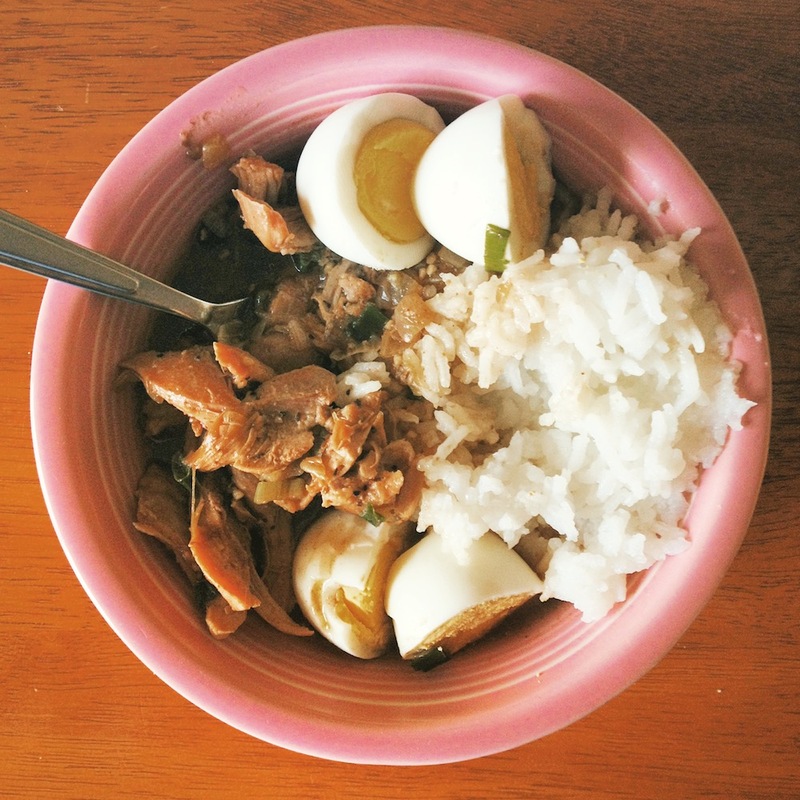 Note: Kai Pa Lo is traditionally made with pork, but this recipe called for chicken. I dig the meat swap; the chicken comes out super juicy and the result is totally mouthwatering. Tonight I’m making it for the second time; the first was a knockout success. *These are slight variations from Penzeys’ recipe, which called for 1 diced medium yellow onion, 1 tsp. minced garlic, 1 TB. soy sauce, white rather than black pepper, 1 TB. brown sugar and no salt. I embellished it to my own personal taste. Sauté the minced onions in a large pan. I use my Le Creuset Everday Pan. Add the garlic after a few minutes, then push it all to the side. Combine the soy sauce, roasted garlic and pepper. Mix well. Douse the chicken in the liquid-y soy sauce rub and place in the pan. Sear each side for a few minutes. Step 4: Make It Soupy! Add the chicken broth. Yes, all 4 cups. Bring to a quick boil then let simmer for about 45 minutes, turning the chicken every so often. Add about 3/4 rice to a rice cooker and let it do it’s thang. Soft or hard boil the eggs. Step 6: Make It Sweet! While the chicken soup is simmering, mix together the brown sugar and Penzeys Chinese Five Spice. After the chicken has simmered about 45 minutes, pull it from the soup. Toss in the sweet mix from step 6 and stir lightly. Pull apart/shred the chicken with two forks and replace into the dish, letting it simmer and soak in the juices for another 10 minutes. Home stretch here! Dish out some white rice, scoop on some chicken (don’t forget the broth!) and add a halved egg. Enjoy! 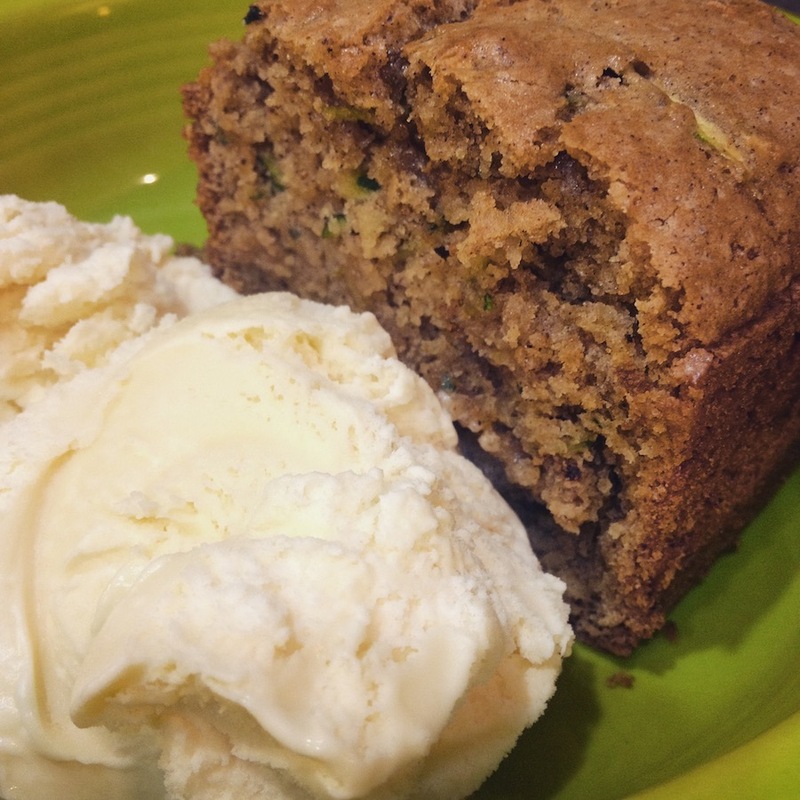 This super easy and delicious gluten free zucchini bread recipe comes courtesy my mother, who found it on Hillbilly Housewife. I’ve modified it ever so slightly slightly to fit my preferences (and those of my wife) over the course of more than one dozen bakings. Given my passion for cooking, I’m hoping to post more recipes here in the future. Some will be old mainstays, while others will be new favorites as we find and master them. This is one of my favorite parts, as it totally plays to my OCD. I always pull out all my ingredients in advance and display them so I can easily pick and pull what I need as I go. And, as I go, I put them away as well. Makes for a tidy kitchen! Once you have them displayed as pictured above, now it’s time to get to work! First, the variations. Hillbilly Housewife (see her original recipe here) calls for 1/3 cup vegetable oil rather than 1/4 cup butter, which is what I use. She also adds walnuts whereas I do not. Finally, rather than mixing separately, I mix the wet ingredients then blend in the dry to use fewer dishes. Step 2: Preheat Your Oven! This one is easy! Preheat your oven to 350F. Combine the eggs, sugar, butter and vanilla in a large bowl and mix well with a whisk or — my preference — a high heat baking spoon scraper. It’s easy and, since you’ll be using it later, means one less dish to wash upon completion. For my bowl, I use my green Le Creuset 2 quart Batter Bowl. Add in your dry ingredients including flour, baking powder, baking soda, cinnamon, cloves, and xanthan gum. Stir and mix well by hand. Again, I use my trusty ol’ baking spoon scraper to mix as its not too difficult and uses fewer dishes. NOTE: I tend to mix it until the dough starts to form but the dry ingredients haven’t fully absorbed into the wet. Then I move on to Step 5. This helps introduce more liquid into the dough and makes mixing a bit easier. Cut the ends off a medium-sized zucchini and grate it using a cheese grater. One medium zucchini should yield approximately 3/2 cups. Combine it with the dough and mix until it nice and consistent. Step 6: Prep Your Pan and Bake Away! Pour the batter into a greased pan. I use a red Le Creuset Cast Iron Pâté Terrine. Bake at 350 degrees for approximately 60 minutes or until toothpick comes out clean. As always, the final step: enjoy! I recommend serving with a scoop of vanilla ice cream. © Copyright Andy Fenstermaker, MBA 2019. Powered by WordPress.